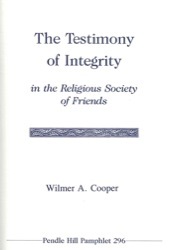 A cogent insightful description of the central testimony among Friends from which all other testimonies evolve. Wilmer Cooper grew up among Conservative (Wilburite) Friends in eastern Ohio. He is a graduate of Olney Friends School and Wilmington College. His education includes graduate degrees from Haverford College, Yale Divinity School and Vanderbilt University. During World War II, he did alternative Civilian Public Service under the American Friends Service Committee. In the 1950s, he was Associate Secretary of Friends Committee on National Legislation in Washington, D.C. He joined the faculty of Earlham College in 1959 and was the founding Dean of the Earlham School of Religion. Following eighteen years as Dean, he became Professor of Quaker Studies until his retirement in 1985. He has continued teaching part time and writing on Quaker subjects. He is the author of two books, The ESR Story: a Quaker Dream Come True 1960-1985, and A Living Faith: a Historical Study of Quaker Beliefs, published by Friends United Press, 1990. He and Emily Cooper live in Richmond, Indiana and in Florida. They are members of West Richmond Friends Meeting, Indiana Yearly Meeting.